This chapter provides background information and defines the terminology used in orbit analysis and mission planning. Approximate expressions, appropriate for hand calculation, are provided and motivated so far as possible. 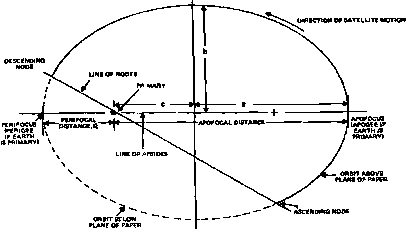 Many general technical works are widely available in the areas of celestial mechanics and orbit analysis; among the more popular are Baker , Baker and Makemson , Battin , Escobal , Herrick , Kaplan , McCuskey , Roy , Ruppe , and Thomson . In contrast with the approximate formulae presented in this chapter, the precise specification of the past or future position of spacecraft or celestial objects is done by means of a numerical table, or ephemeris, listing the position at regular intervals. Ephemerides of solar system objects in the form of printed tables are provided in annual editions of the American Ephemeris and Nautical Almanac and its British equivalent, the Astronomical Ephemeris; versions for computer use are provided on magnetic tape by the Jet Propulsion Laboratory. Both of these sources of définitive information are described in Section 5.5. 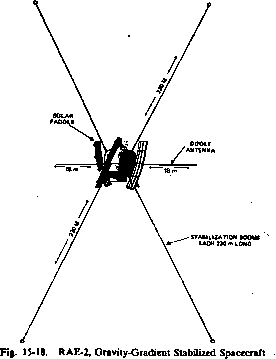 Definitive spacecraft orbits are normally provided only on magnetic tape or disk and are discussed in Section 5.4. Predicting the motion of the Sun, Moon, and planets was a major part of the scientific revolution of the Sixteenth and Seventeenth centuries. Galileo's discovery of the satellites of Jupiter in 1610 provided a break with Aristotelian science and a strong argument for Copernicus' heliocentric theory. Danish astronomer Tycho Brahe determined the positions of the planets to about 1 minute of arc (1/60 deg) and the length of the year to about 1 second with the unaided eye. Tycho's German assistant, Johannes Kepler, used these precise observations to derive empirically the rules of planetary motion which would later be justified by Newton. where F is the force between two objects of mass m and M, r is the vector between them, and G is Newton's constant of gravitation. Accurate orbit work includes the effect of the nonspherical symmetry of the Earth, perturbations due to third bodies, and nongravitational forces, but nearly all the basic foundations of orbit theory are direct extrapolations of Newton's work as foreseen by Newton himself. * When gravity is the only force, the orbit defined by two interacting objects is completely determined by their relative position and velocity. In addition, two spherically symmetric masses interacting gravitationally must remain in the plane defined by their relative velocity and position because the forces are central and there is no force to move them out of this plane. Kepler's First Law: If two objects in space interact gravitationally, each will describe an orbit that is a conic section with the center of mass at one focus. If the bodies are permanently associated, their orbits will be ellipses; if they are not permanently associated, their orbits will be hyperbolas. Kepler's Second Law: If two objects in space interact gravitationally (whether or not they move in closed elliptical orbits), a line joining them sweeps out equal areas in equal intervals of time. Kepler's Third Law: If two objects in space revolve around each other due to their mutual gravitational attraction, the sum of their masses multiplied by the square of their period of mutual revolution is proportional to the cube of the mean distance between them-, that is, where P is their mutual period of revolution, a is the mean distance between them, m and M are the two masses, and G is Newton's gravitational constant. * The theory of relativity plays a very minor role in the orbits of planets (principally Mercury) and spacecraft designed specifically to test the theory. For practical purposes, relativistic effects may be totally ignored. The more massive of the two objects, M, is called the primary and the other object is called the secondary, or satellite. 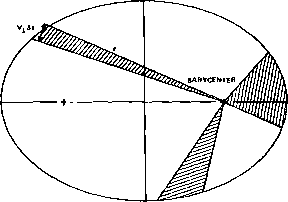 The barycenter is the location of the center of mass between the two objects. Kepler's empirical relations presented in two works in 1609 and 1619 were essentially the same except that the constant of proportionality in the third law was obtained empirically and the shape of the orbits specified in the first law was an ellipse (one of the four possible conic sections) because his experience was limited to the planets. Kepler's First Law. Kepler's First Law states that the orbits of celestial objects are conic sections i.e., figures produced by the intersection of a plane and a cone (Fig. 3-1), or any quadratic function in a plane. If the objects are permanently associated, this figure will be an ellipse, as shown in Fig. 3-2. Geometrically, an ellipse is defined by two points known as foci-, the ellipse is then the locus of all points such that the sum of the distances from each point on the ellipse to the two foci is 2a, where a is called the semimajor axis and is half the long axis of the ellipse. 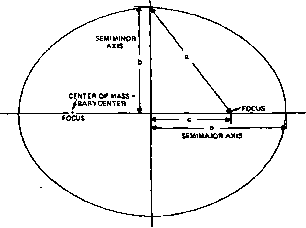 The semimajor axis is also the mean distance between the focus and the boundary of the ellipse and is often listed this way in tables of orbit parameters. In Fig. 3-2, the quantity c is half the distance between the foci, and the semiminor axis, b, is half the short axis of the ellipse. One of the foci is the barycenter of the two objects; the other focus is of only geometric interest and is an empty point in space. 3-1. 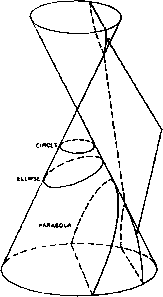 The (out conic sections result from the intersection of a plane and a right circular cone. Two special cases occur when the angle between the plane and the axis of the cone is either 90 deg (resulting in a circle) or equal to the angular radius of the cone (resulting in a parabola). Both the circle and parabola represent special cases of the infinite range of possible eccentricities and therefore will never occur in nature. Orbits of objects which are gravitationally bound will be elliptical and orbits of objects which are not bound will be hyperbolic. Thus, an object approaching a planet from "infinity," such as a spacecraft approaching Mars, must necessarily travel on a hyperbolic trajectory relative to the planet and will swing past the planet and recede to infinity, unless some nongravitational force (a rocket firing or a collision with the planet) intervenes. Similarly, a rocket with insufficient energy to escape a planet must travel in an elliptical orbit in the absence of nongravitational forces. Because the ellipse is a closed curve, the rocket will eventually return to the point in space at which the engine last fired. Fig. 3-3. Four Possible Conic Sections. The circle and parabola have uniquely defined shapes, but there is a continuous range of shapes (determined by the eccentricity) for the ellipse and hyperbola. Kepler's Second Law. As shown in Fig. 3-4, Kepler's Second Law is a restatement of the conservation of angular momentum. The angular momentum is proportional to the magnitude of the radius vector, r, multiplied by the perpendicular component of the velocity, V±. In any infinitesimal time interval, St, the area swept out by a line joining the barycenter and the satellite will be | V±r8t. 'Alternatively, we may define a conic section as the locus of all points which maintain a fixed ratio between the distance to the focus and the perpendicular distance to a fixed line called the directrix. The directrix is perpendicular to the major axis of any conic section. The ratio of the distance to the focus and to the directrix is the eccentricity, e.
Fig. 3-4. Kepler's Second Law. Because the three shaded areas are equal, the times required for the satellite to cross each area are equal. The area swept out is directly proportional to both the time interval and the angular momentum. Hence, the area swept out per unit time is proportional to the angular momentum per unit mass which is a constant. The values of n=GM for the major objects in the solar system are given in Appendix L. Note that ¡i can be measured with considerable precision by astronomical observations. However, the values of M are limited by the accuracy of G to about 0.06%. (This is the most poorly known of the fundamental physical constants.) Therefore, the use of G is normally avoided and calculations are best done in terms of p and the ratio of the masses of solar system objects. As long as the mass of the secondary is small, such that Eq. (3-4) holds, then the constant of proportionality in Kepler's Third Law may be evaluated directly from existing orbiting objects. For example, the astronomical unit, or A U, is a unit of length equal to the semimajor axis of the Earth's orbit about the Sun; thus, in units of years and AU, fi/4w2= 1 for the Sun and; therefore; a3=P2 in units of astronomical units and years for the planets and any other satellites of the Sun. lessness" in space. Thus, if two objects, such as an astronaut and his spacecraft, are initially in the same orbit, they will remain in the same orbit and stay adjacent even though they have very different physical properties and are unconnected. A satellite launched with this velocity in any direction will not return, assuming that there are no other forces. is the hyperbolic velocity, or the velocity of an object infinitely far away from the primary. Here V is the instantaneous velocity in the hyperbolic orbit at arbitrary distance R from the center of the massive object. Orbit Terminology. For either hyperbolic or elliptical orbits, the perifocus is the point on the orbit where the secondary js closest to the baiycenter. As shown in Fig. 3-5, the perifocal distance, or the linear separation between the barycenter and the perifocus, is (a — c)=a(l — e) for an elliptical orbit of semimajor axis, a, and eccentricity, e. Unfortunately, the terminology here is both well established and awkward because different words are used for the point of closest approach to different primaries. Thus, we have perihelion (closest approach to the Sun), perigee (closest approach to the Earth), pericynthiane or perilune (closest approach to the Moon), and even periastron (closest approach of the two stars in a binary pair). Fig. 3-5. Orbit Terminology for an Elliptical Orbit The orbit is tilted with respect to the plane of the paper such that the dashed segment is below the paper; the plane of the paper is the reference plane. 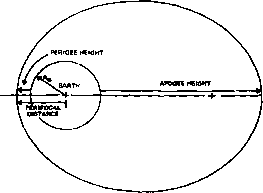 Perihelion and perifocus are measured from the center of mass, but perigee height, frequently shortened to "perigee" in common usage, is measured from the surface of the Earth. (See Fig. 3-6.) This terminology arises because we are interested primarily in the height above the surface for low-altitude spacecraft. The most unambiguous procedure is to use perigee height or perigee altitude whenever the distance is being measured from the surface;* however, this is not always done. 'Throughout this book when discussing distances relative to the Earth, we use "height" exclusively for distances measured from the Earth's surface; e.g, "apogee height," "perigee height,** or "height of the atmosphere." To define an orbit fully we need to specify not only its size and shape, but also the orientation of the orbit plane in space. (See Fig. 3-7.) 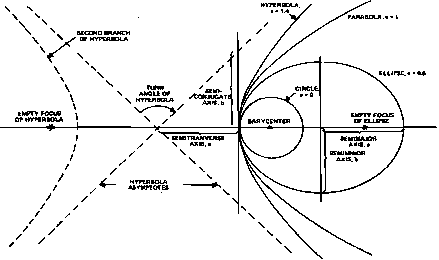 The inclination, i, is the angle between the orbit plane and a reference plane, which also contains the barycenter. The most commonly used reference planes are the equatorial plane (the plane of the Earth's equator) for Earth satellites and the plane of the Earth's orbit about the Sun, called the ecliptic.